Nintendo was present during the 2016 San Diego Comic-Con (SDCC) and the company featured one of their latest games during the convention “Paper Mario: Color Splash.” The newest “Paper Mario” game offers the latest adventure of the classic Nintendo character, Mario, but in a different format. The mustached plumber is set in a 2D world and the game will be exclusive to the Wii U console. This time, Mario’s new journey, as showcased in a gameplay trailer, takes him to a haunted hotel where the staff is comprised of mostly Toads. Most of the game is still located in Prism Island, and the main concept of the game is to give life to the surroundings by splashing color. Mario is also equipped with the paint hammer, a weapon that is unlike any other. He uses the hammer to battle his enemies and at the same time give them the right color. Although, Mario can’t always use the paint hammer since its use is monitored by a paint meter located on the screen. 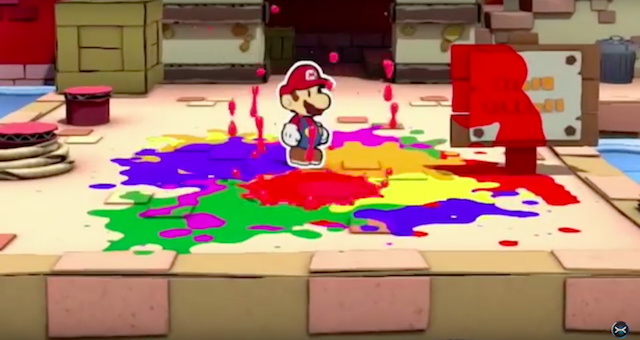 In the demo, there were white spots located in a particular stage and Mario must smash those spots so that coins and attack cards would be able to come out. Those cards will help Mario during his battles. Other cards are usually used to smash enemies with the hammer or stomp on them with Mario’s foot. There are also attacks that are powerful but are harder to come by and must be used only during special occasions. The player’s strategy mostly depends on the attack cards. For example, if there are enemies with horns, a hammer card must be used in order to defeat it. If the gamer wants to add more damage to his attacks, Mario can splash some colors onto his cards. Mario will not only deal with enemies but with puzzles as well. There will be new challenging puzzles that will be found within the game. “Paper Mario: Color Splash” is set to come out on Oct. 7 for the Nintendo Wii U.